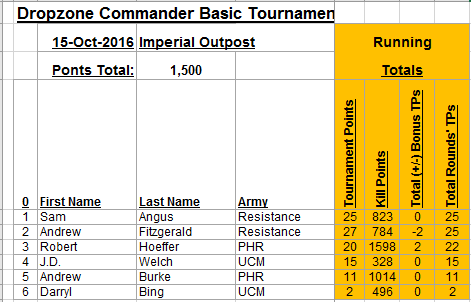 Last Saturday, October 15th, 2016, we held our 12th Dropzone Commander tournament, this time at Imperial Outpost Games (IO) in Glendale, AZ. Once again we had 6 players, but unfortunately only for Round 2 – one of the guys, Darryl, was very late getting to IO due to a freeway closure (that I forgot to warn him about – D’oh! ), and when he did arrive he was very gimpy due to an injury to his Achilles tendon, so he only lasted one Round, Round 2. So we had 2x UCM, 2x PHR and 2x Allied Resistance, and zero Scourge or Shaltari. 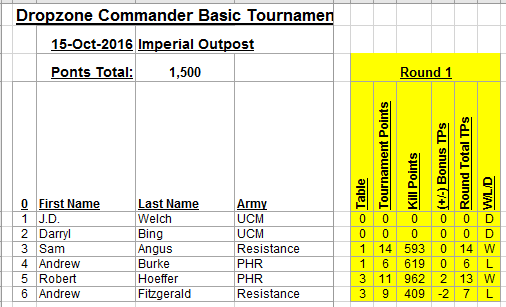 And, since Darryl missed Round 1, and had to bow out of Round 3, the only round that saw UCM playing was Round 2. 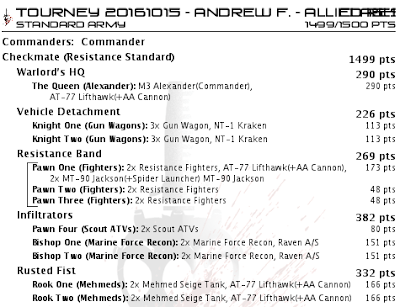 Environmental Rules were introduced to Dropzone Commander in Reconquest: Phase 2, and add a bit of spice to the missions you can play from any of the rule books. I wanted the Environmentals to have a minimal effect on each Round, and I wanted them to be balanced across the tournament in terms of which factions might be affected the most by each one. So no Fauna was used, and only one Environmental Rule per mission. 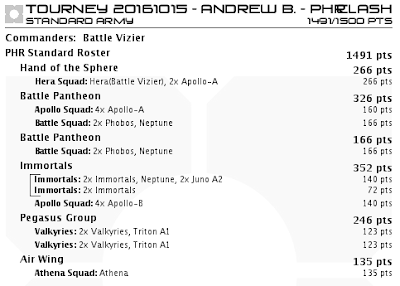 Andrew F. (Major Awesome on the Hawk Forum) originally only requested one mission with an Environmental Rule, but I consulted with our other Talon here in Arizona, James Winnett (Achilles), and we agreed that for balance purposes all three of the missions should come with some form of non-Fauna Environmental Rule. I set up four tables (with the help of Major Awesome and his awesome scatter terrain) so that there would be sufficient variety for the players across all three rounds. This is what I typically do, but in retrospect might not have been necessary given that each board had to be reset for each subsequent mission. However, the way the tables are set up at IO, if we had tried to squeeze all three 4’x4’ boards across the two 4’x8’ tables that were set end-to-end with each other that were assigned to us, there wouldn’t have been enough room for everyone’s stuff (dice, dice boxes, rule books, army lists, templates, dead pile, etc.) between all three boards, so it’s great that Darren, the owner of IO, afforded us a third 4’x8’ tables on which to set up. Speaking of which, this was our first event held at Imperial Outpost Games, and Darren was a very gracious host. The venue is a fantastic store that has grown significantly over the 11 years that I’ve lived in The Valley of the Sun, encompassing now what used to be three separate stores. It is clean and well lit, very well stocked, and very busy every time I’ve been there! The entry fee for the tournament was our standard $10.00, however Darren kicked in an additional 25% ($15.00), bringing our prize pool to a respectable $75.00 of store credit. Thanks, Darren! 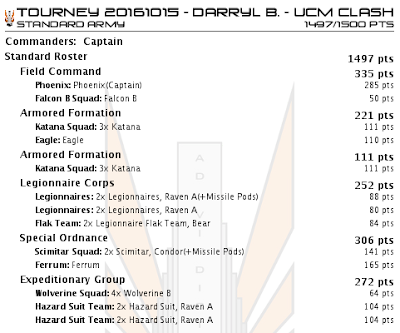 In addition to the store credit available to give out as prizes, I also had a show-only PHR Aegaeon medium dropship that I would be giving out to first place, courtesy of Hawk Liam, the new Hawk Wargames Hawk Talon liaison. However, in addition to that, Rich Kappmeier of Green Stuff Industries also provided a set of 3 Structure Damage Markers, which I would award to First Place, and a set of 3 “To The Deck” tokens that slot onto a Dropzone flight stand, which I would award to Second Place. Thanks, Rich! Darryl showed up about 45 minutes into Round 1, so he and I sat out that round while he got his army set up, and then we watched the action on the two tables. 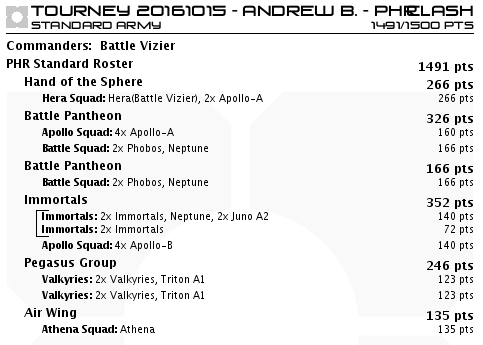 Round 1, Table 2 - J.D. vs Andrew B.
I only took a few pictures of my game vs Andrew B., but I've already written up a battle report on that game, and I'll be posting it up here on The Road to Valhalla a bit later. At this point Darryl said that he didn’t have to play Round 3 if it worked out that he didn’t need to; I think his Achilles tendon was really bothering him, as he was very gimpy the whole day. Checking the scoring spreadsheet I saw that there was one combination left where all four of the remaining players hadn’t yet played each other if Darryl (and subsequently, I) dropped out at this point, so that was no problem (for the pairings, that is – I would’ve liked to have played another game with this UCM list, but in the end I was pretty pooped as it was by the end of the night, and sore as hell by the time I got home at 11:30 PM, so all-in-all it was probably for the best!). Yes, the dreaded “mirror match” for all four remaining players! Oh, well, what are you gonna do? It was inevitable, I guess. Andrew B. and Robert, who carpool to nearly every event and Friday DzC Nights, had only ever played each other once in the past, so I had no problem pairing them up this Round! 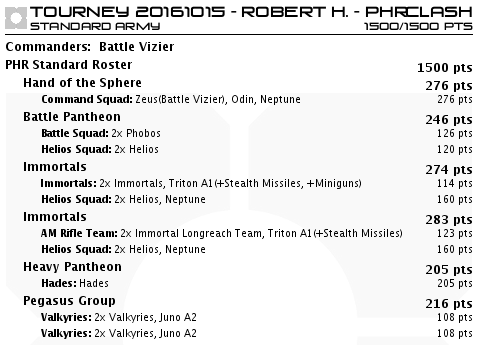 Hot PHR on PHR Action! 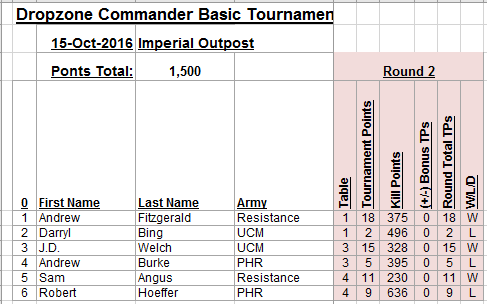 Meanwhile, Sam and Major Awesome were tied at 25 Total Tournament Points at the start of this Round. None of us had ever played Defense Line before, and this was only Sam’s fifth game of Dropzone Commander at 1,500 points, so I was interested to see how the games would play out. Mega Mike Burch of Orbital Bombardment fame declares this mission to be his favorite (of all time? 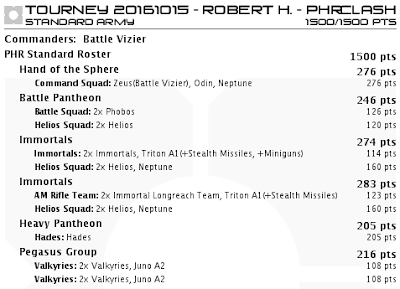 Or just of Reconquest: Phase 2? Not sure…), which further piqued my interest. 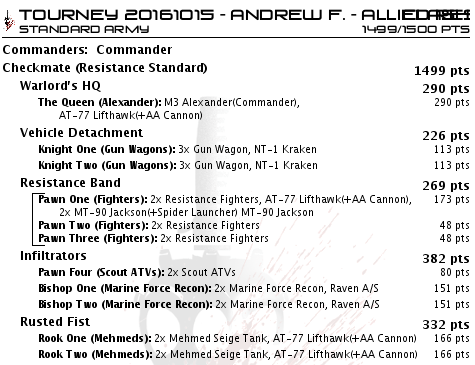 Andrew F. had three sets of Infantry with their own form of transportation – 3 squads of Fighters in Jacksons in a Lifthawk, and two squads of MFR in Raven A/S’s – whereas Sam only had the Lifthawk full of Fighters and the Kraken with two Battle Buses, one with Fighters and the other with Veterans. This proved to be decisive in terms of who could even score on the Critical Locations in the bunkers in this game. In one bunker Sam and Andrew both piled in all of their Fighters, which was a helluva scrum. 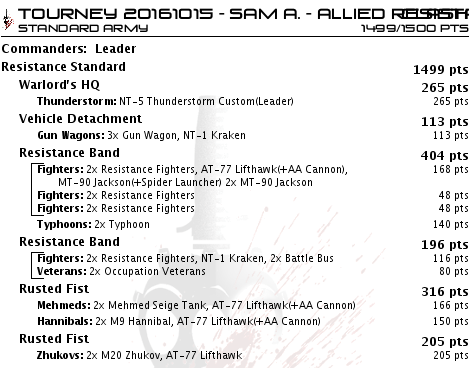 Andrew was the only player who could get any Infantry into the middle bunker, one of his squads of MFR, while the other squad of MFR was set to face off against Sam’s other Fighters paired with the Veterans. This last bunker’s CQB looked to be pretty even, until Andrew played the command card that let him add a squad of Resistance Fighters to that fight, which tipped the balance in his favor significantly. 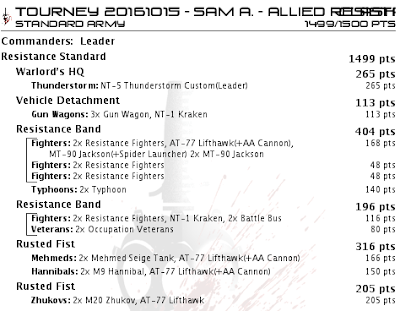 Sam had a command card to play, too, but his Thunderstorm was a mere inch away from the bunker, so his Infantry in the bunker wasn’t within the Sphere of Influence of his commander. Must've been something somebody said... -- Allied Resistance Clash! Turn 4, quite the scrum! I'm glad you guys know which models are whose, Sam and Andrew! As a result, Sam determined that there was no way he could win mathematically. However, I urged him to continue to play it out, as the final results of the tournament may surprise him, depending on how well he did and how things turned out in Robert and Andrew B.’s game. As you can see, Sam missed out tying Robert on Total TPs by just 1 TP. If Robert hadn’t done as well as he had against his buddy Mr. Burke, Sam might have placed Second instead of Third, which is why I had urged him to play out the Round rather than just concede after he calculated he couldn’t possibly win. 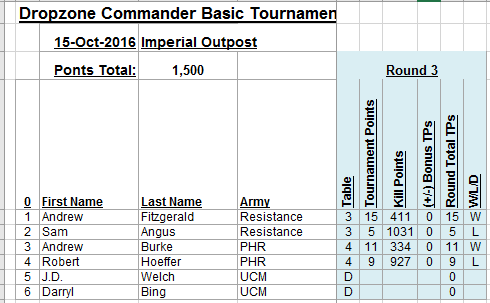 It’s important to keep the overall tournament scores in mind when you’re faced with that sort of a inevitability in a Round, and not simply fold, in my humble opinion. During the lunch break, Andrew Burke had commented that he had a Starter Set’s worth of painted Shaltari that he had acquired, but didn’t see himself venturing too far down the Way of the Hedgehog any time soon. I knew I had a spare Shaltari Starter Set that I’d received from Hawk Simon for prize support over a year ago sitting in the trunk of my car, so when it looked like Mr. Burke would likely end up in Last Place regardless of how he finished Round 3, I surreptitiously snuck the box into the store and stashed it out of sight by my scorer’s table. This Shaltari Starter Set, which had been awarded to players in the past but which had always been turned back into the prize pool for a future event (because it was James Winnett and Andrew Fitzgerald who had previously won it, and both are well established Shaltari players without a need for another Starter Set’s worth of models) would finally find a home as the “booby prize” for Andrew B.’s last place finish! Better luck next time, Sam! After it was all said and done, everyone said that they had had a great time (as had I, as usual). I asked them how they liked the Environmental Rules being in each Round, and they all enthusiastically agreed that it had been a good idea! So if you are setting up your own tournament, consider adding one (non-Fauna) Environmental to each mission that your players will be tackling! 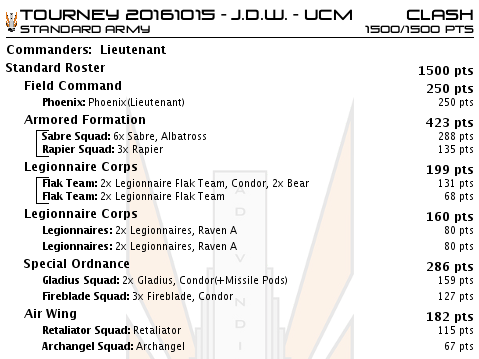 We set a tentative date of “early December” for the next “event”, but it’s unclear whether that will be another Dropzone Commander tournament, or some sort of Dropfleet Commander event where we can bust out what we all hope we will have for Dropfleet by then. It’s also unclear how many of us, including myself, will be available for any kind of event in early December, as the Silly Season will be upon us, and there may be family commitments that we will have to bear. Ah, well, such is the fate of the gamer in December! I hope you all enjoyed reading this little tale. 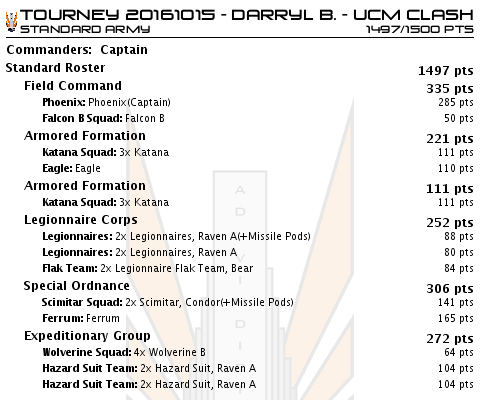 I encourage you to organize your own Dropzone Commander tournament in your area, regardless of whether you have a Hawk Talon around to act as the TO. You might find that you like doing the organizing yourself, at which point the next logical step would be to apply to be a Talon yourself! Please leave a comment below, and thanks again for reading! Good read! I hope to be down there with something at the end of the month.